Our membership is our compass. We are delighted to feature one of our 64 member organisation every month on our blog. This time, we interviewed Isabel Proano of the European Federation of Allergy and Airways Diseases Patients’ Associations (EFA), who provides an overview of her organisation in five short answers. 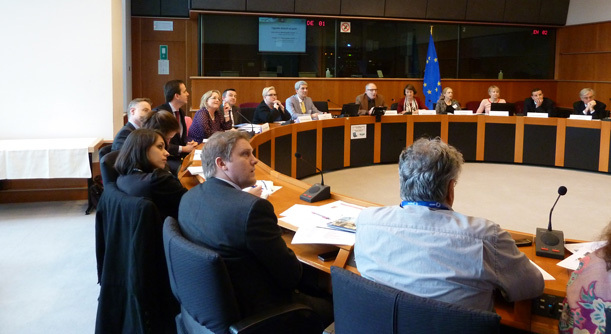 One of our key activities for this year is to ensure the functioning and impact of the new European Parliament Interest Group on Allergy and Asthma. We share the Secretariat of the group with the European Academy of Allergy and Clinical Immunology (EAACI) and together we are working to gather more MEPs support and to bring meaningful actions for patients. We are also advocating for an EU Strategy on chronic diseases and we have just published a report to harmonise care for chronic obstructive pulmonary disease (COPD) patients in Europe. 30% of the European population is affected by allergy, asthma and COPD. Our role is to ensure that the voice of those patients is represented at EU level. Everything we do is with and for patients to have the right and access to best quality care, to participate in their care, have a safe environment and to live uncompromised lives. We are becoming more and more successful in bringing the “health in all policies” principle forward, which is key for allergy and respiratory diseases. For us, good quality care must me coupled with a healthy environment. We are working on topics that are not just related to health, but to many other aspects of EU policy development which affect the lives of the patients we represent. No matter the disease we cover, we all represent patients. At EFA we are conscious that we need a strong and united patient voice to increase awareness, quality care, patient participation and specific disease research at European level. Besides, there are many cross-cutting issues affecting patients that require lots of expertise from different sectors and such a work can only be done through an umbrella structure like EPF. What’s the main misconception about your disease area? Unfortunately, asthma and allergies are still considered second class chronic diseases and the result is catastrophic. Patients are too often stigmatised because of their food allergies, coughing or their wheezing or even penalised because authorities consider their disease is self-inflicted, like in the case of ex-smokers that live with COPD. EFA Communications Manager, Isabel has extensive experience in advocacy and campaigning at European and international level. Prior to joining EFA in April 2014, she worked with the United Nations and Save the Children in humanitarian advocacy and mobilization for public health.